Parties are awesome social gatherings! 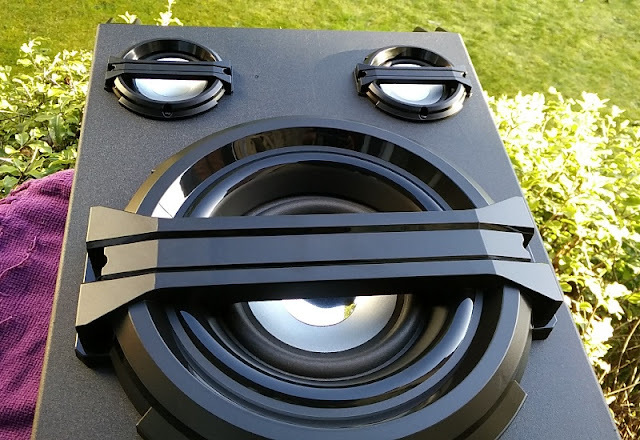 If you are planning on hosting a house party or wedding ceremony you don't have to spend hundreds in a sound system to get everyone dancing and having a great time! 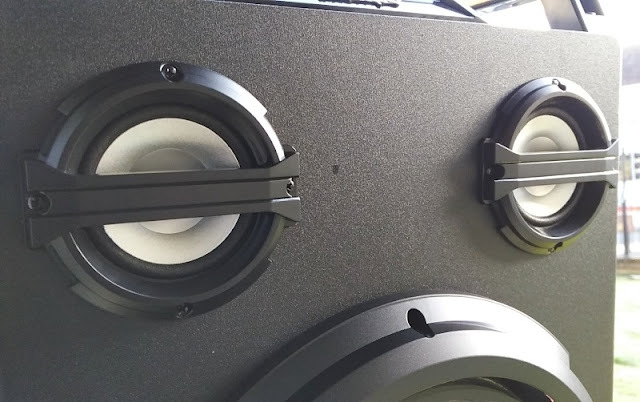 With a party speaker like the Intempo EE2383 or the Tailgate led speaker, you get a music speaker solution that doubles as a public address loudspeaker that you can use to communicate with your guests. 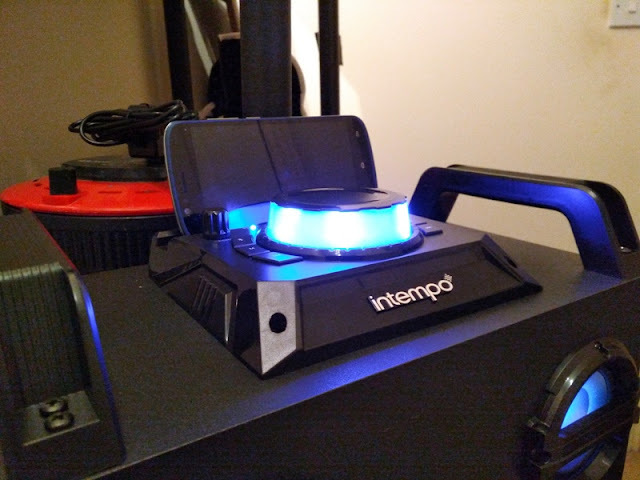 You can pick up the Intempo EE283 Bluetooth 4.1 party speaker or this Bluetooth Jukebox without putting a dent on your bank account and accomplish the main objective of an indoor gathering and that is filling up the room with sound! 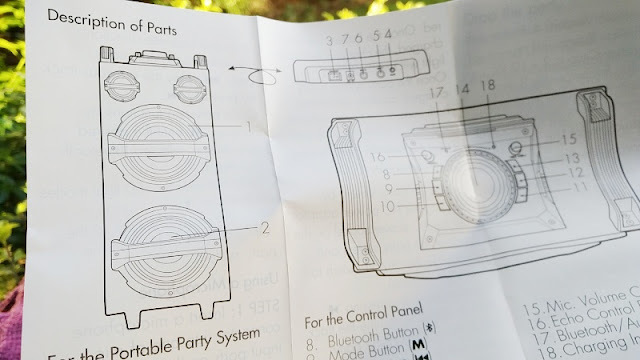 If you plan to organize a fairly small gathering of, say, 50-60 people and know exactly what the attendees will want to hear, a portable party speaker system like this Intempo sound system is all you need. 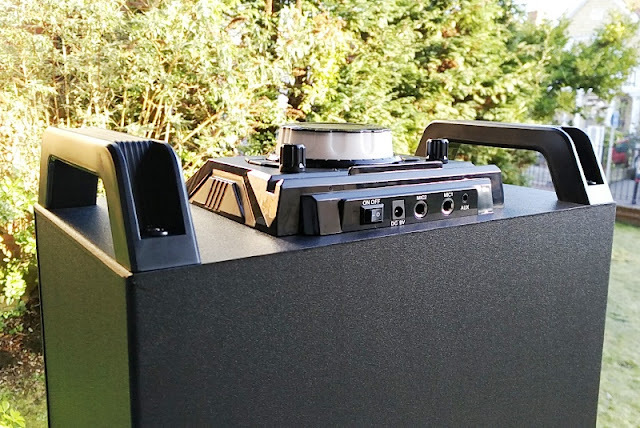 Simply plug in your laptop, smartphone or another audio source into the Intempo EE2383 portable party speaker and away you go. You won't have to worry about no cringey DJ or super cheesy 90's party songs since you will be playing songs from your own music playlist. 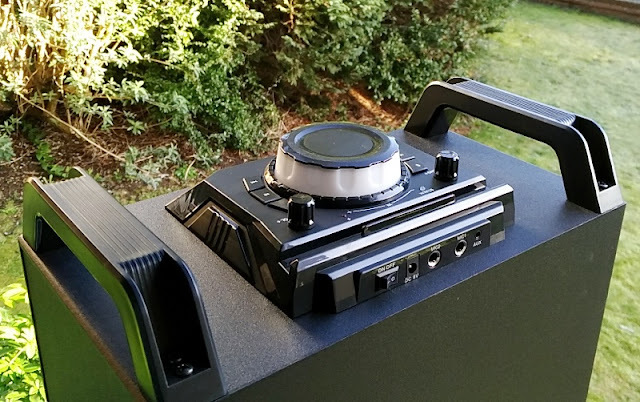 Even better, you can play music via a digital music service like Spotify Premium that gives you access to millions of songs, letting you become your very own radio DJ so people can request songs they would like to hear. 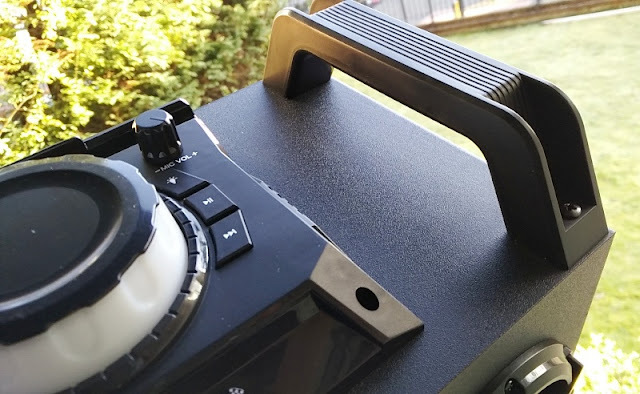 The cool thing about choosing a musical digital service is that you have full control of the kind of music that you want and don't played played. 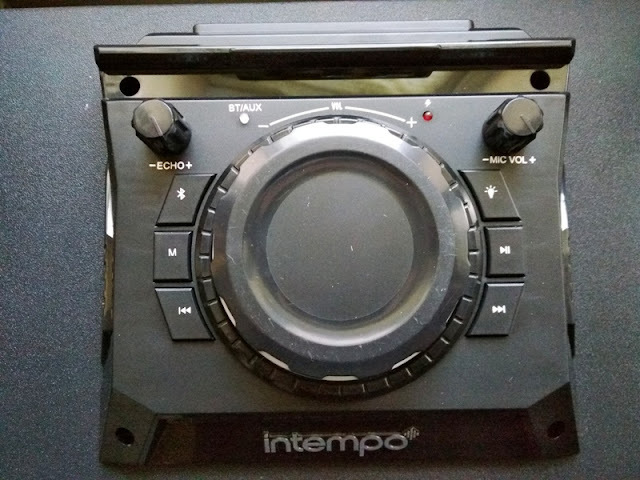 The Intempo party speaker features a deck control with six buttons, two small knobs and a large dial knob to control the volume. 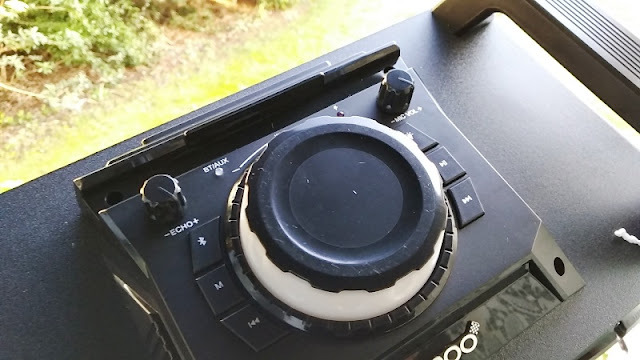 The ECHO knob on the left controls the reverberation of sound, while the MIC VOL knob controls the volume level of the microphone. 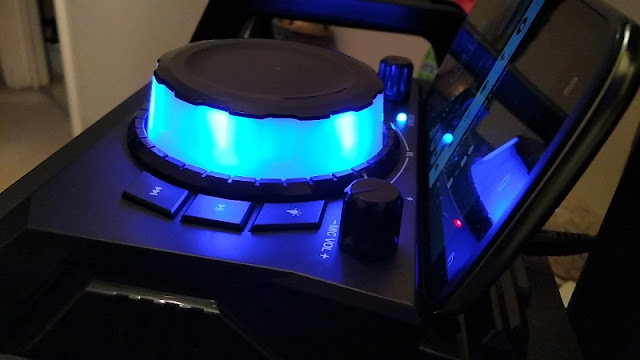 Between the knobs, you see also two small leds. 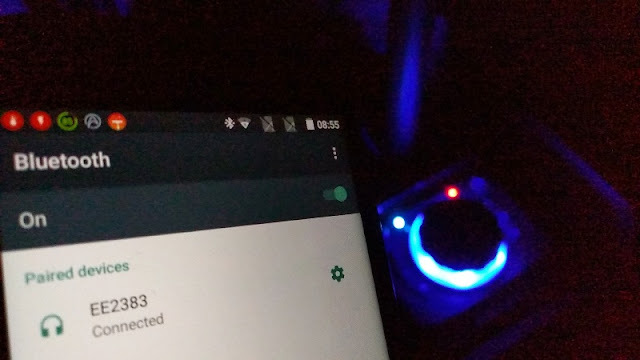 The left led that says BT/AUX lets you know whether you are in Bluetooth mode (flashing blue led) or wired mode (solid blue led). 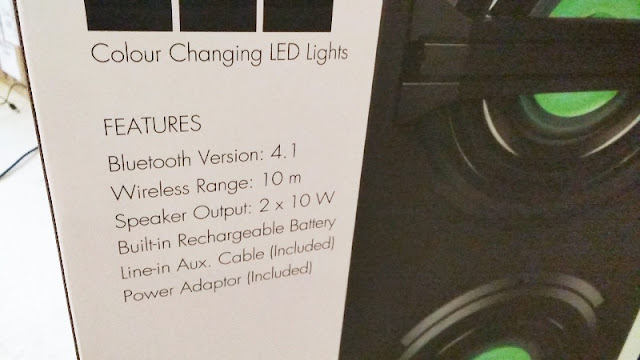 The red led on the right is the charging indicator light. From left to right, the buttons include Bluetooth, M (wired mode), skip back track, Lighting, play/pause and skip forward track. 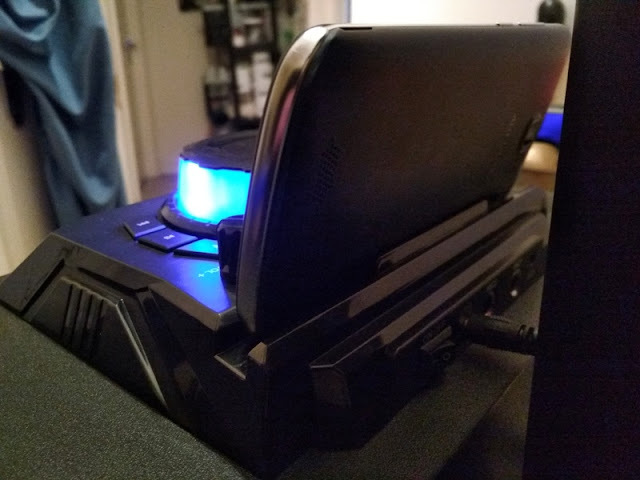 The long gap you see on top is designed to hold up a smartphone or tablet. 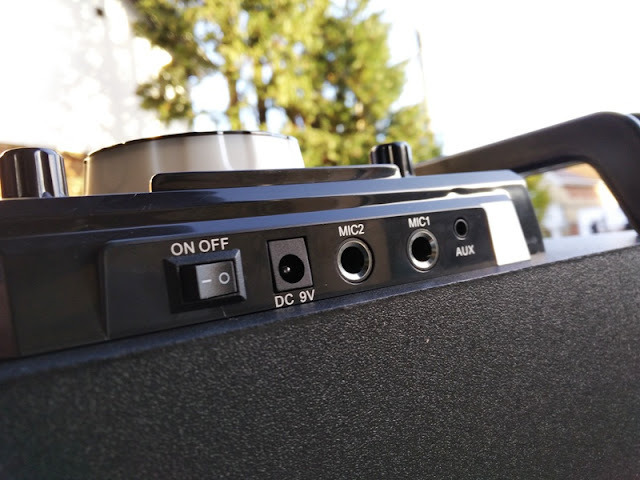 While in Bluetooth mode, you can control the audio playback via the deck control or external audio source like a smartphone. 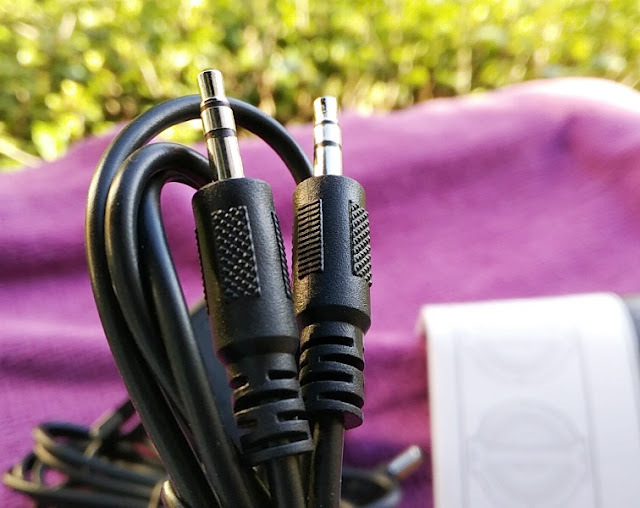 In wired mode, you can only control the audio playback from the external audio source. 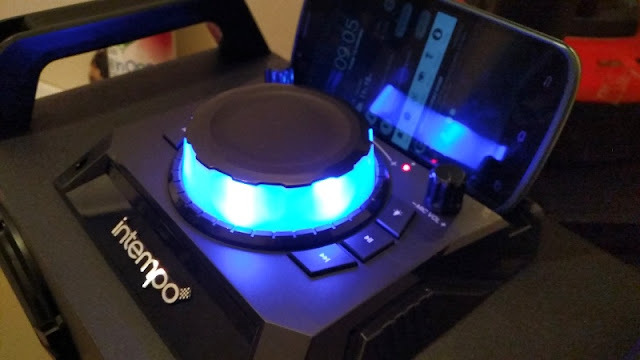 The back of the Intempo deck control features an on/off power switch, a 9V DC port, two quarter-inch microphone sockets and an AUX port to wire the Intempo party speaker to a smartphone or any audio source with a 3.5mm audio jack. 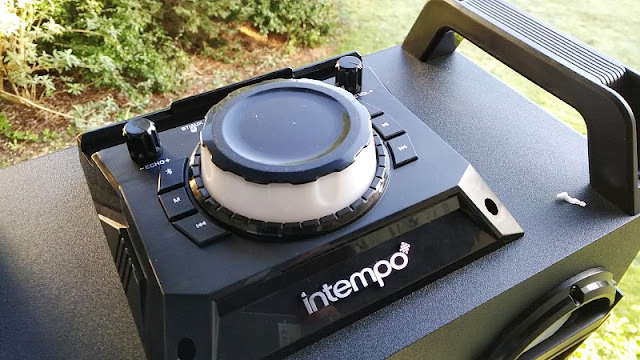 The Intempo EE2383 Portable Party Speaker has wheels and rubber stomps on the base of the speaker to keep the unit securely upright and for transporting it around. The entire unit weighs just 9 kilograms. 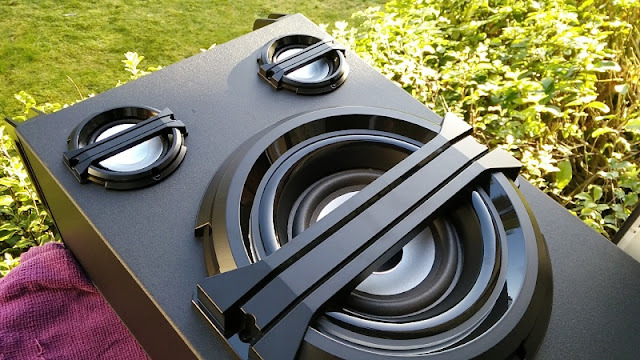 The Intempo EE2383 Portable Party Speaker has two small 3W front speakers and two large 8W front speakers with a total output power of 20 watts. 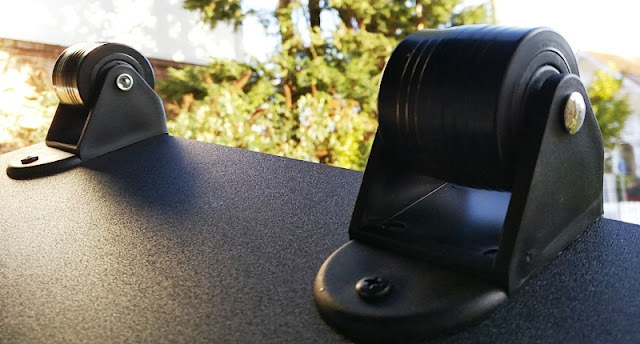 Built-in the speaker is a 7.4V 1800mAh li-on rechargeable battery that can power the unit for 3 hours. 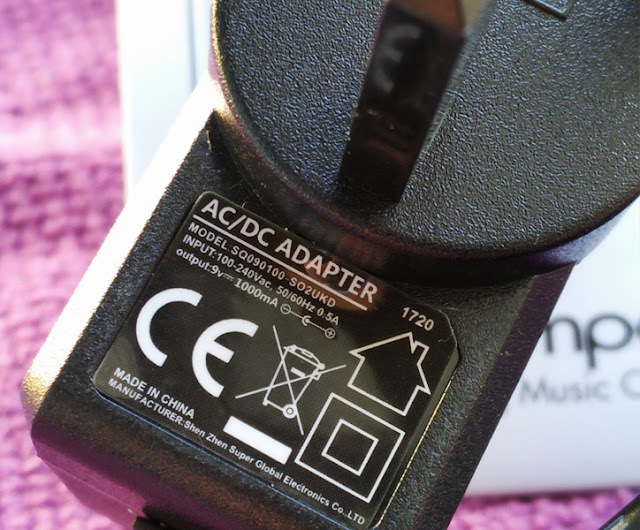 Full charge takes 6 hours and it's carried out via the included mains power adapter which has a 2ft cable that ends in a 2.1mm DC power connector. 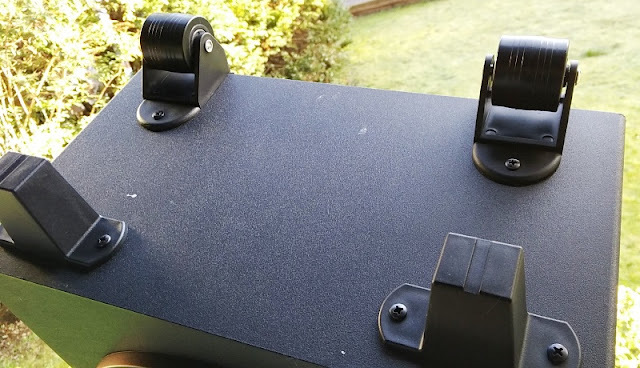 The do-it-yourself party route really makes sense and money sense too as it will save hundreds in PA hire, DJ hire or live wedding band in the case of a wedding ceremony. Nobody better than you can "dot the i's and cross the t's" when it comes to taking care of every detail, even minor ones like music choice. 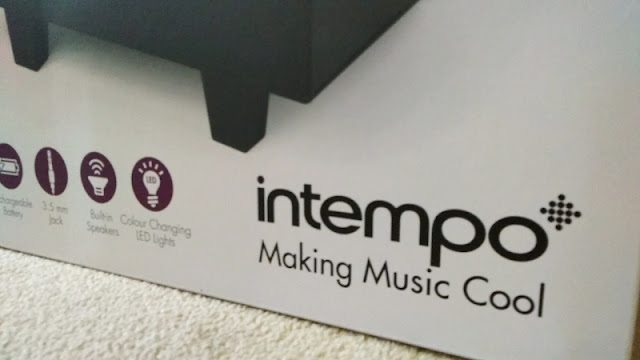 This Intempo speaker is a logical choice. Besides, would you rather not play original music via your phone than pay for a live band or DJ to do cover songs or remixes of songs? 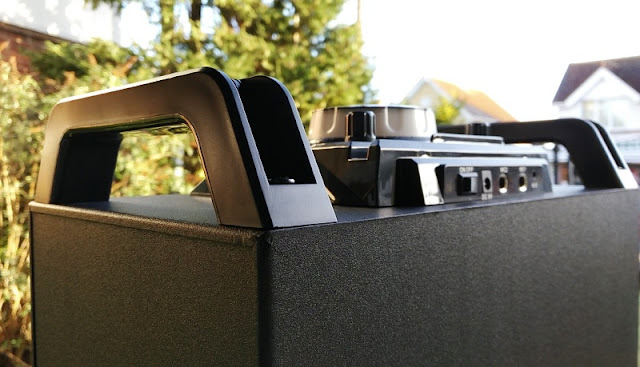 With a speaker powerhouse system like the Intempo EE2383 Portable Party Speaker you get a really loud speaker that plays loud music with decent bass, clear highs and watt power to reach a sizeable party of people. 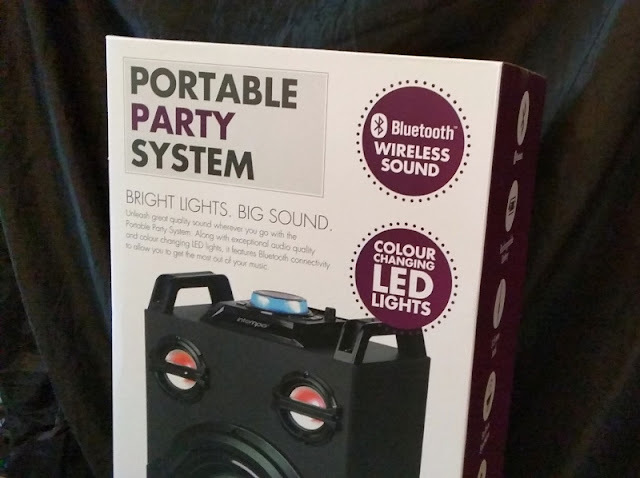 Plus, the party speaker comes with cool led disco lighting and the microphone jacks are a great bonus as it lets you utilize the Intempo EE2383 Portable Party Speaker as a public address PA speaker, which is perfect for wedding speeches or on the spot speeches to welcome your guests or address your guests all at once.